Most rifles with iron (well, in most cases plastic or steel) sights ship with those pieces adjusted to what is called a “factory zero”. Basically they are boresighted (aligning the bore with a known target, then aligning the sights…), boxed up, and shipped off to your friendly local FFL for sale. Sometimes you get lucky, and out of the box the rifle is on point. But other times you may not be. With holographic weapon sights (HWS) such as the EOTech 552, the sights are obviously not zeroed in appropriate to your rifle. So, you have to mount it, and “zero it in”. Of course, you could just lean against the bench at the range, fiddle with the windage & elevation (horizontal & vertical) controls on your new HWS, and get minute-of-bad-guy accuracy out of it, and call it a day. I did that for awhile. And, for range fun, this is alright. However, the procedure itself wastes ammunition, and doesn’t do much for precision. Nor can you diagnose problems with your shooting style, i.e. grip, stance, breath control, trigger manipulation, and so on. Since, if the sight is off, you can’t tell if it is you, or your equipment. That’s where taking the time to truly zero in your equipment comes in handy. Here’s what I did to get the “50 yard” zero. I live in an urban area in South Florida. Getting out to the outdoor ranges will literally soak up an entire business day. I’m not a professional doorkicker, so I have to budget time accordingly. Thus, when I really want to shoot, and I want to shoot now, the only realistic option is an indoor range. Most of the ranges in South Florida max out at 25 yards for rifle shooters. 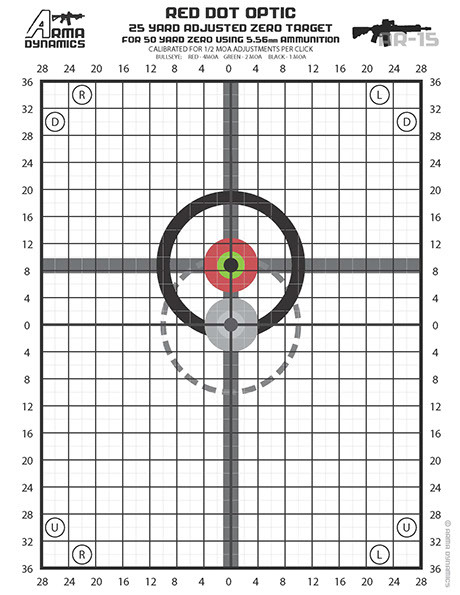 For the AR platform, a lot of professional shooters recommend a 50-yard zero. 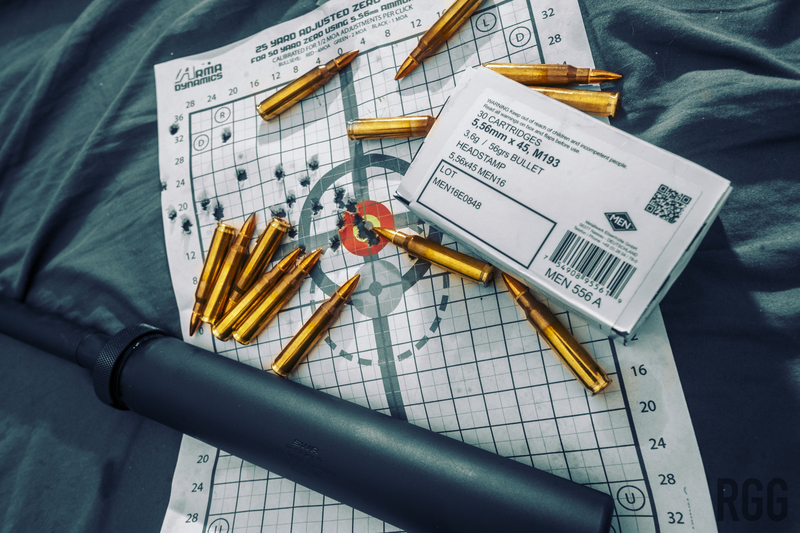 However, more and more recognize that your average AR owner cannot get to a range with 50 yards or more of shooting space, and thus they are limited to a 25-yard distance. So, I did some Googling around for a solution. Enter Arma Dynamics. 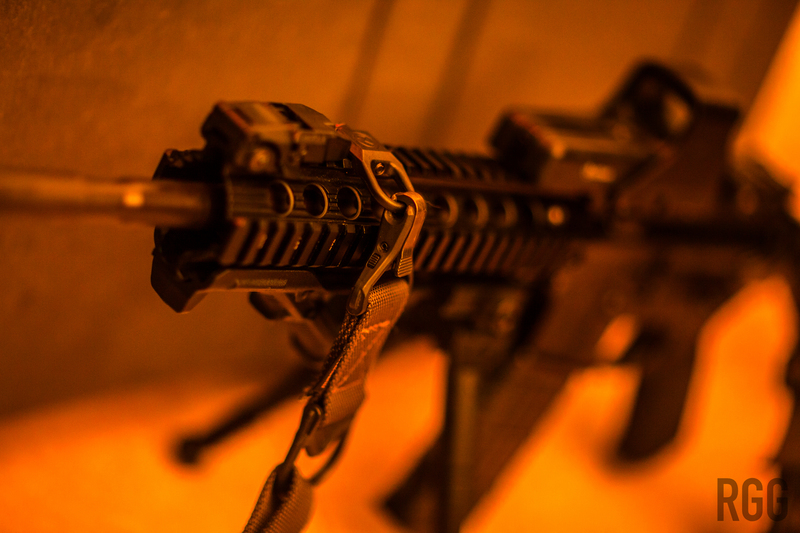 The various forums, including (of course), Arfcom and M4Carbine, all had a plethora of solutions to address what I term the “doing 50 with only 25” problem. Eventually I whittled down to the Arma Dynamics solution. And it all comes down to ballistics. 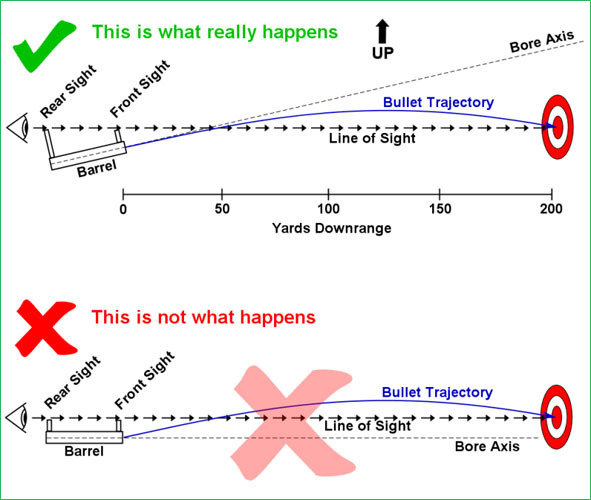 When fired from a gun, a bullet does not travel in a straight line. Assuming the impossibility of no recoil and shooter influence, there’s our old friend, gravity, affecting the projectile. The second it leaves the barrel, the bullet is being pulled towards the ground, even as it rises. 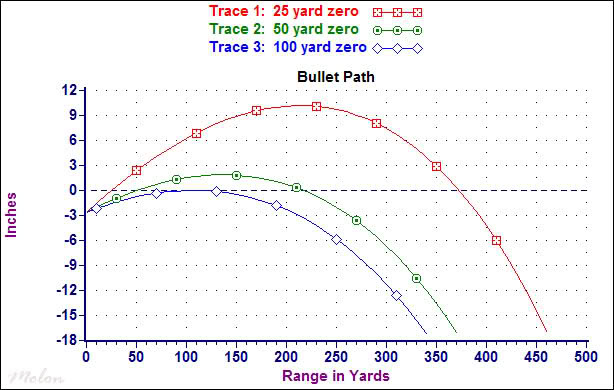 Yes, the bullet travels in an arc if you are doing this correctly. Anyways, as you can see, a projectile crosses an imaginary horizontal line at 25 yards, and then another one slightly above that at 50. The Arma Dynamics target accounts for this. The colored bullseye represents where 50 yards would be if the range was 50 yards long, whereas the grey bullseye represents where you need to aim in the 25 yard scenario. In the interests of achieving some semblance of real accuracy, I downloaded the Arma Dynamics target. You can get it here for various scenarios with the AR & AK platforms. I packed up my Colt LE6920, EOTech 512, Silencerco Specwar 762 suppressor, 180 rounds of 5.56mm 56-grain ammunition by MEN out of Germany (SGAmmo had an amazing deal on this load…), a generic Caldwell bipod, the usual accessories, and set off for my favorite indoor range in South Florida, Nexus Shooting. Firearms are hugely popular nowadays, and Nexus is reaping the benefits. So much that there was an hour-and-a-half wait for a rifle lane. Not having the time, the Regular Girl and myself decided to go to our alternate, Shoot Straight. Nexus, on the off-chance you read this, set up a reservation system. You could even charge a service fee and plenty of South Florida shooters would gladly use it. The key to zeroing in, of course, is to eliminate most of variables. In absence of a bench rest, I had the aforementioned (cheap as hell) bipod in order to achieve a modicum of stability. Also, factory ammunition is a must. The MEN 5.56 I selected was actually well-reviewed, and considered some of the best training ammunition in the world. With reloads, you introduce another variable, mainly things like how much of a powder charge the reloader put in, and so on. And yes, my suppressor introduces a big variable, but it’s always on my rifles, so it’s pretty much a constant at this point. I was way off, despite aiming for the bullseye. Yes, check out my Instagram feed for daily photo posts and content, ha ha.